It´s high summer here, but look what I found in the TV magasine: I´m not sure whether it´s an advertisement for insulation or home insurance (yes, my German is that bad...) but the knitted house on display sure does look nice! 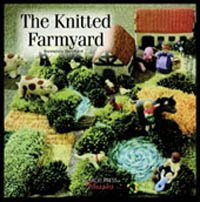 ..I've got a great combo for your farmhouse knitting: Knitted Animals by Anne Dorthe Grigaff. A great book with fun and easy patterns.